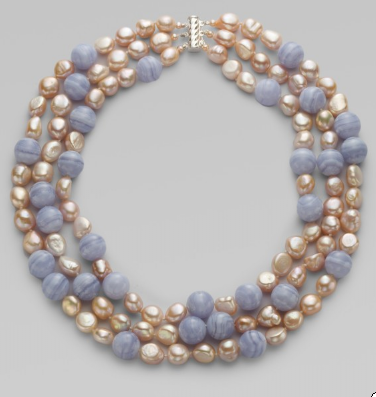 The gracious Hostess of the humble bungalow has asked me to post the sixth blog image (ever, I guess) and in the spirit of the game, here it is, an image of pearls designed by Zara Scoville of Priceless Imperfection. Zara works in "dirty" or non-white pearls; wearing one of her pieces is an ongoing dream. What le heck, while we're in the Passage, let's look at some new pearls, pearls of infinite mood and various prices, and all genuine pearls. 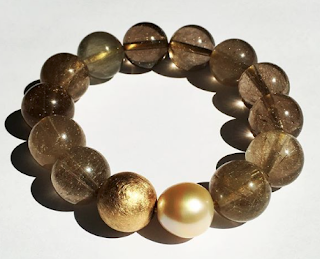 Stacked Kamoka Tahitian keshi bracelet, price, $235 from Kojima Company. 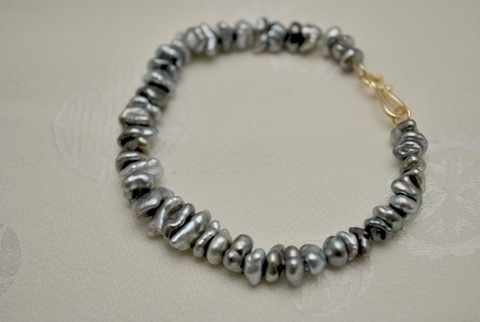 Lustrous natural gray and silver 5.5-7mm pearls with 14k yellow gold clasp. Organic yet polished. Gurhan pearl drop earrings, price, $1,193 from Bergdorf Goodman. 15mm pearls, hammered silver and 24k gold. Just about the perfect-with-everything earrings, and they look so good. Harrison Morgan triple-strand blue chalcedony, pink freshwater pearl & sterling silver necklace, about 22 inches, price, $425 from Saks Fifth Avenue. I see this on Betty Draper, lending instant self-possession... then, a stolen kiss with Henry Francis. (Can he really be that courtly? We will find out in July.) Divine on a blonde or silver haired woman. Then there are pearls for Patti Smith. TEM's four-row pearl collar with each strand a different type of pearl, which you can only sort of see in this shot. (From outside in, stick, round, oval and stacked keshi.) Price, $1,740 from Barneys. Too bad they shot it on white, but check the site and zoom in– it's worth it! 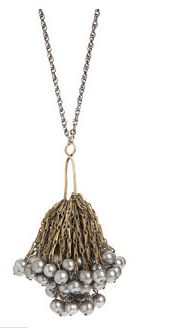 Aesa Sadko necklace, grey pearl and brass cluster on an oxidized 20-inch silver chain. In a v-neck, oh yes. Price, $395 from Barneys. Elegance in motion. 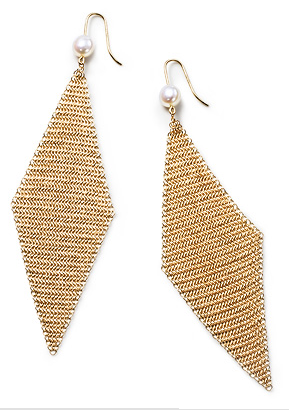 Elsa Peretti 18k gold mesh and pearl earrings are light, malleable and alluring. 3.5 inches long, also available in a shorter, smaller size. $950 from Tiffany. Birdsong, flowers, pearls! May your heart be light. This is all very new to me, since I hopped on the cart much later, first only reading the posts and comments, then starting to make my own careful comments on the bagsnob ( btw., who else shares my opinion, that the bags they show are not as interesting as say 2-3 years ago? ), then finally starting a blog of my own. Duchesse, do you still feel the same, when you now read your 6th post, or is there anything, except the prices, you would change? I always love your pearl posts:). No matter how many I read. metscan: "Other than the prices"?? ?- I am not sure what you are asking. My goal is to not show anything I consider overpriced unless I am illustrating a point about value. 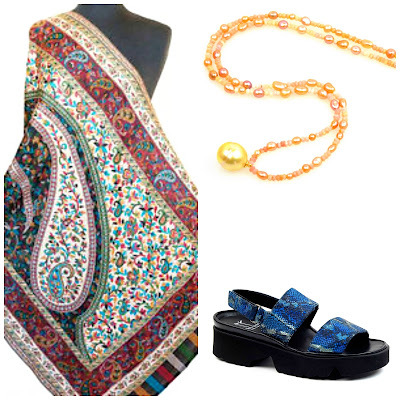 LPC: You;re a pearl girl too! 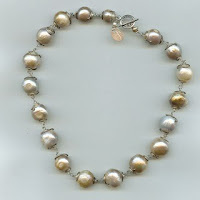 This is a blog about 'pearls and other things'. Oh how I love Zara Scoville's designs! I too covet them in some far off place... my pearl collection is lovely and full, but Zara's designs are so unique! Thanks for posting. 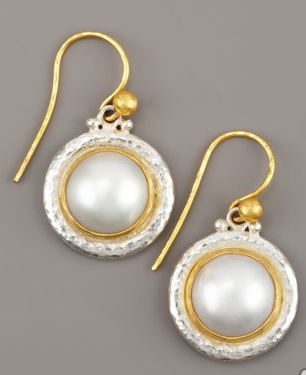 Love, love, love those big pearl earrings! And with silver and gold accents, they would be very versatile. 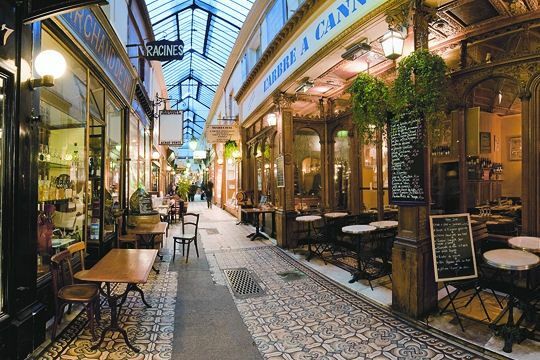 Duchesse, I took Metscan's comment to mean that prices of the objects you have shown in the past might have changed simply because of the passage of time. Pearls are timeless....and I love seeing so many different styles. I rarely see such interesting designs except here on your blog! You are the Queen of Pearls! Duchesse: Sorry, I did not express myself clearly. SewingLibrarian got it right. I meant, that the prices might have changed since you first wrote your post;) ! Secondly ( and this concerns only me ),I sometimes wonder how on earth could I have said/liked something like whatever at some time. And by this I mean, that ( this concerns only me too), that my likings change, sometimes slowly, sometimes at a snap of my fingers. I hope I now expressed myself ok :)! Sewing Librarian: After paying my income taxes today, thought I'll be damned if this is where every nickel goes, and bought a new strand from Kojima Company. Will post when it arrives! hostess: My mission: to get womanly, interesting pearls around the necks of womanly, interesting women. metscan: Thanks, see what you mean now. Prices have not risen in the two years I've been blogging, as inflation has been low. My perspective has remained so constant that I occasionally worry about sounding like a broken record! Duchesse, I look forward to seeing what you have purchased from Kojima when it arrives! I've been wearing my multi-colored ovals a lot since I received them. I always love your pearl posts, nobody else does them quite like you. I'm a pearl girl too! I can't wait to see your new purchase. Dear Duchesse, I LOVE YOUR MISSION STATEMENT : "to get womanly, interesting pearls around the necks of womanly, interesting women." You are the Internet-Fashion-Feminist -Walt Whitman of my heart! 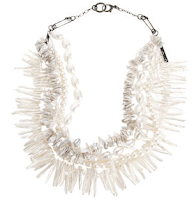 I think that the necklace from Barney's is fabulous and resonable in terms of the price.